Following the discovery of a huge amount of Saxon Gold the Chancellor today announced a plan to move the pound back to being measured against the gold standard and a distribution of revised coinage. This will be a first step in a series of reforms to support hard pressed public finances. 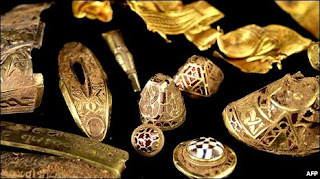 The Saxon hoard is comprised of thousands of gold coins, which will form the basis of the new currency, as well as some gold ornaments, which will be sent to pawnyourgold.co.uk. The Chancellor said that the full plans would be unveiled once the Prime Minister had returned from his voyage across the Atlantic – his galleon is due to return in a couple of months – mutinies allowing. The Chancellor refuted claims that a couple of thousand coins would be insufficient upon which to base the economy, saying that this was just the first phase.